Background Weight gain is a common problem in breast cancer patients and is reported to be associated with poorer survival. However, most data are limited to Western women. 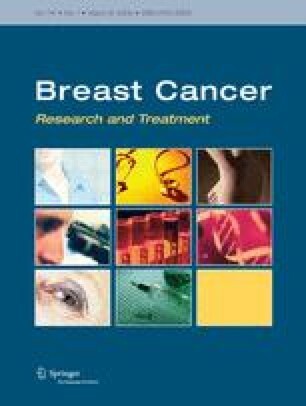 We evaluated weight changes after adjuvant treatment in Korean women with early breast cancer. Methods The authors reviewed the records of 260 patients with stage I–III breast cancer treated between June 2003 and February 2006. Body weight, body mass index (BMI) and menopausal status at baseline and after 3, 6, 12 and 24 months of adjuvant treatment were reviewed. Results Mean patient age was 47.0 years and 61.1% of women were premenopausal. Among them, 195 patients (75.8%) received chemotherapy and 186 (71.5%) received hormonal therapy. Mean baseline weight was 57.5 ± 9.8 kg and mean BMI was 23.5 ± 1.6 kg/m2 (22.8 ± 3.0 vs. 24.7 ± 3.2 kg/m2 for pre- vs. post-menopausal women, P = 0.286). Mean weight changes were; 0.30 kg at 3 months (P = 0.019); 0.16 kg at 6 months (P = 0.367); −0.34 kg at 1 year (P = 0.082); −0.40 kg at 2 years (P = 0.097). Twenty-three patients (10.4%) gained more than 5% of baseline body weight at 1 year, but no clinical variable was found to be associated with these weight gains. Conclusion This study shows that Korean women with early breast cancer do not gain weight after adjuvant treatment. Further studies are needed to determine differences between Asian and Western women in terms of weight changes and prognosis in early breast cancer. This study was supported in part by a grant from the Korean Health 21 R&D Project, Ministry of Heath & Welfare, Republic of Korea (0412-CR01–0704-0001).